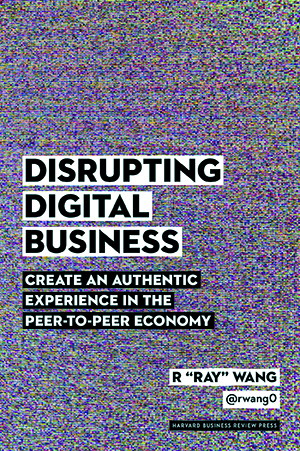 I am excited to announce Disrupting Digital Business will be published by Harvard Business Review Press for world wide availability in Q2 2015. As many of you know, I started this journey to write a book almost 4 years ago. It was around the time I had decided to leave Altimeter Group and start Constellation Research. I was kindly presented with a very generous book contract. At that time, social media and social business was in full swing and a number of folks were putting out their social media story. While social was hot, an underlying shift was in motion. The combination of disruptive technologies, people to people (P2P) networks, and new business models seeded the beginning of a digital revolution. It seemed that we had new laws of business emerging amidst this change. This revolution may have started in the late 1990’s with the hype of dot.com business models. However, the internet era was a foreshadow of things to come. Right now, we’re standing at the dawn of a digital business revolution. In fact, we barely realize it. And as with the beginning of every revolution, those in the midst of it can feel it, sense it, and realize that something big is happening. Yet it’s hard to quantify the shift. The data isn’t clear. It’s hard to measure. Pace of change is accelerating. Old rules seem not to apply. You and I can’t seem to put structure around this. In fact, 52% of the Fortune 500 have been merged, acquired, gone bankrupt, or fallen off the list since 2000. The impact of digital disruption is real. However, it’s not the technologies that drive this change. It’s a shift in how new business models are created through digital transformation. Old line businesses are reinventing themselves as digital businesses. New digital business models challenge existing incumbents. We’re moving at a rapid pace of change and massive scale from systems of transaction (record) to achieving mass personalization at scale (digital). Book availability. Print editions and e-books will be available worldwide in Q2 2015. Pre orders on Amazon are expected January 2015. Roadshow and book tour. A Constellation roadshow on Disrupting Digital Business is being planned for 2015 and we will seek sponsors for this roadshow. In search of a publicity firm. I’m in search of a good business press and media influencer publicity professionals. The goal is exposure to a broader set of business influencers in both broadcast and print. Looking for a good speaker’s bureau. I was with Monitor Talent and their model has changed since acquisition by Deloitte and Stern Speakers. I’m seeking business events where digital and innovation are key themes. Constellation’s Connected Enterprise 2014 – Dominate Digital Disruption October 29th to 31st, Half Moon Bay Ritz Carlton. Ready to begin your digital transformation? Still looking for a CDO? Want to jump start your digital business efforts? Let us know how you are getting there and what first steps have worked. Add your comments to the blog or reach me via email: R (at) ConstellationR (dot) com or R (at) SoftwareInsider (dot) org.